We first reviewed a prototype RED Dragon and were suitably impressed by the high score it achieved despite having a smaller-than-full-frame sensor. We’ve now tested a prototype of RED’s new Helium 8K, and it has earned the highest sensor score we’ve seen to date. It appears one time again that RED has a highly advanced sensor program. As with the Dragon, the score is not included in our official ranking, as it is based on a prototype unit (which allows saving images as RAW), but it does give a good indication of the device’s capabilities. The Helium’s most obvious upgrade from the Dragon is 8K video capture. For example, the Weapon 8K uses the new Helium sensor and can capture 8K video at up to 75 fps (60 fps with RAW high resolution format). The less-expensive Epic W also incorporates the new sensor, and can capture 8K video at up to 30 fps. Since the Helium sensor is physically similar to the Dragon’s 30mm x 16mm size (similar to APS-H in DSLR terms), its pixels are packed more densely – about 3.65 microns each. So we were very impressed that the new model surpasses the dynamic range, color depth, low-light ISO, and noise ratings of the Dragon’s 6K sensor. Both units advertise 16.5+ stops of dynamic range, which is just slightly above our measured 15.2 stops. As the 2 Red cameras tested were prototype, we display below a simulation of the ranking that would included these 2 devices. In addition to its amazing throughput (as shown by its high framerate, even at high-resolution), the most unique feature of the RED cameras’ image quality is that they manage to outperform full-frame DSLRs in several areas – despite having sensors that are only about two-thirds the size. Our measured dynamic range of 15.2 stops – very close to the 16.5 claimed by RED – is not only higher than any other APS-H sensor we’ve tested, it is higher than the best of the full-frame sensors in our database. While Tonal Range measures the scope of tonal values a sensor can capture and distinguish from noise, Color Depth provides a similar metric for the range of colors it can capture before they are affected by noise. Here also, the Helium posts a record-setting score, measuring nearly 27 bits of Color Depth, higher than any of the full-frame DSLRs we have tested. Helium’s massive dynamic range and color depth make its support of 16-bit RAW output particularly important, as the additional precision is needed to ensure that subtle tonal and color gradations can be preserved across its large gamut of tonal range and color. 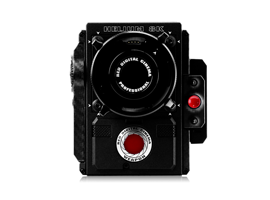 Being focused on the controlled shooting environments typical of cinemaphotography, RED has left analog gain out of its cameras. That means that higher effective ISOs are achieved by multiplying the digital values that are read out of the analog-digital converter (ADC). This approach simplifies circuitry and may help improve image quality at the sensor’s native ISO, but makes high ISO (low-light) performance a challenge. The RED Dragon suffered somewhat in our low-light tests, finishing behind the Sony A7R II and Nikon D810. The Helium has registered a significant improvement here, jumping from 2745 to 4210. We expect that this is from a possible combination of improved sensor design as well as temporal noise reduction (see below). Our SNR print test simulates the overall quality of a 20 x 30-inch print at the camera’s native ISO. Since the Helium’s native ISO tests out at 140 (higher than that of the Sony A7R II), we adjusted the Sony results to simulate an ISO of 140. The chart shows that the Helium blows away the Sony by a surprising margin – especially since the Sony has a larger sensor. We found the same results in this chart which plots the SNR for digital image output by both cameras – the Helium outperformed the Sony by a margin that is too large to be explained solely by improved sensor design. Part of the reason the Helium performs so well in our SNR tests is maybe the very-high quality of the sensor itself, but the difference is too large to be explained by that alone. We expect that another reason could be that the Helium performs some RAW processing – specifically noise reduction – after the captures and before saving the RAW. We analyzed the Helium’s images to try to determine whether it uses spatial or temporal noise reduction (or both). There is a certain inherent unpredictability in the behavior of photons. It is impossible to predict with certainty where a particular photon will land on a sensor. Depending on how large individual pixels are, some number of photons will land on a pixel other than the one you’d expect if they simply traveled in a straight line. This results in a certain minimum amount of noise (sometimes referred to as “photon shot noise”) when an image is captured. For two sensors of a similar design, the one with larger pixels will have more signal and a better SNR, which is a major reason that larger sensors tend to have better low-light performance than smaller sensors of the same type. Aside from larger pixels, the other approach to improving photon shot noise is to increase the fraction of photons received by the sensor that are turned into electrons, thereby creating a stronger signal. That fraction is referred to as the Quantum Efficiency (QE) of the sensor. Since the Helium has a much higher SNR than the Sony sensor despite its smaller pixels, it would need a significantly higher QE to achieve those results – something beyond the commonly understood limits of physics. This in turn led us to look at noise reduction processing as an explanation for the Helium sensor’s very-high QE. These factors make us suspect that there is some type of noise reduction happening in the RED system to provide such high-quality “RAW” images. Given the Helium 8K’s very impressive noise scores, we wanted to see if it is applying noise reduction before outputting the “RAW” files. 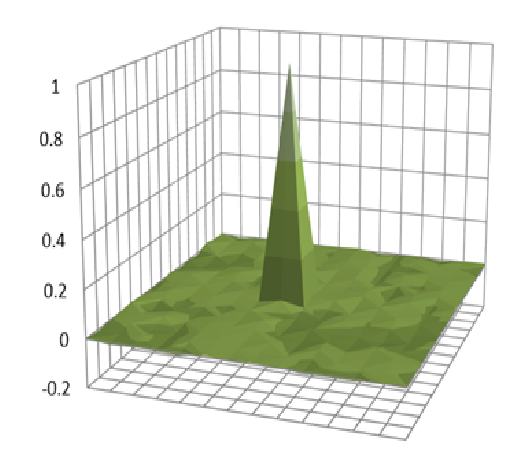 The first kind we tested for is the most typical, spatial noise reduction. This is usually a sophisticated form of smoothing areas that appear to have noise, while retaining edges to minimize the loss of sharpness. This approach typically results in a spreading out of the frequency response of the image, and therefore can be detected through careful analysis. The high frame rate possible with RED’s sensors, including the Helium, mean that they are especially well-suited for noise reduction based on sampling multiple sequential image frames. This technique, called temporal noise reduction (TNR), is most commonly used in video, since there are many successive frames to work with . However, temporal correlations across a time axis are not relevant when analyzing the image quality of a single RAW image, as they do not impact any RAW converters. Whatever noise reduction system RED employs creating the RAW images from the Helium sensor, its presence means that we aren’t measuring just the RED sensor, so its results aren’t directly comparable to those from camera sensors we have tested from other vendors, whose RAW results come straight from the sensor with no prior noise reduction processing. One of the most powerful features of the RED camera system is its modularity. For starters, a sensor such as the Helium 8K can be coupled with a variety of “brains” to create a camera. The Helium is sold either with the Weapon brain (as the WEAPON with HELIUM 8K S35) or the Epic brain (as the EPIC-W with HELIUM 8K S35). Additional accessories make up the rest of the camera, but RED is also known for its exceptionally broad support for a variety of lenses. RED sells mounts that allow its users to shoot with their existing Canon, Nikon, Leica, and PL lenses. In addition, RED has introduced its own line of RED PRO prime and zoom lenses. The RED Helium 8K is the most impressive sensor we’ve ever tested. 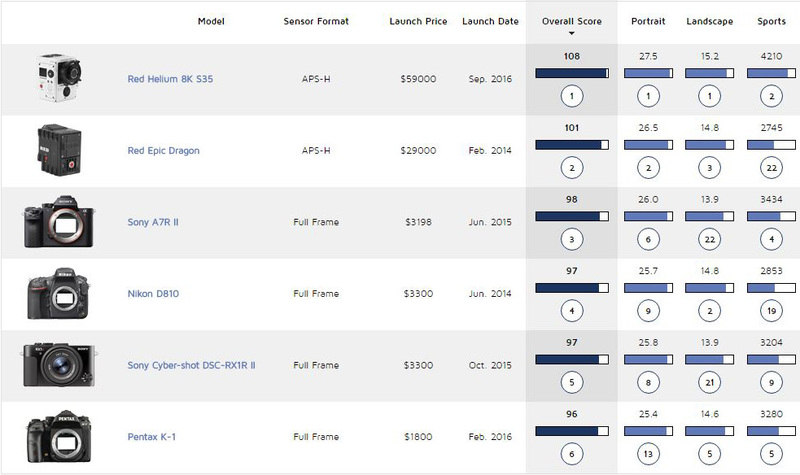 Rating 10 points above the best of the full-frame DSLRs, it stands alone as our top scorer. Its image quality is even more impressive given its very high maximum frame rates. Our only caveat is that the Helium 8K sensor appears to benefit from some noise reduction to enhance its RAW image quality. 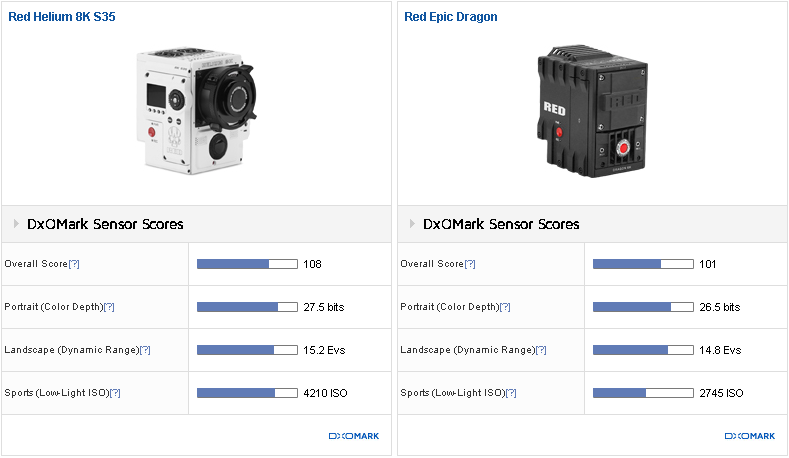 We can likely explain the Helium 8K’s improvement over our previous top scorer, RED’s own Dragon, by a combination of both better sensor technology and temporal noise reduction. The upgrade to 8K video and improved image quality across the board make it a clear upgrade from the RED Dragon – and a clear winner. The Helium 8K is an impressive achievement by RED. For those with the budget, its top-of-the-line image quality, high frame rate, and 16-bit RAW capture capability absolutely make it worth considering as a competitor to high-end DSLRs and medium-format cameras for still image capture.